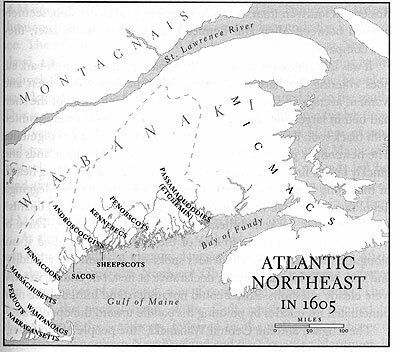 This map shows what is now northern New England and the Maritime Provinces, as settled by Native American tribes and nations. This presentation is somewhat simplistic as it does not indicate that the naming of the peoples here is subject to some controversy. Champlain wrote that "Etchemins" lived in the land between the Kennebec and the St. John Rivers, while other writers equate Etchemin with the Passamaquoddies only. The data is limited, subject to interpretation, and cannot easily be shown on a map. From the book The Lobster Coast: Rebels, Rusticators, and the Struggle for a Forgotten Frontier by Colin Woodard, published by Viking in 2004. Map drawn by Jojo Gragasin. Map used by permission of the author. Library of Congress catalog number F27.A75 W66 2004.